Pope Paul V (Latin: Paulus Quintus; Rome, 17 September 1552 – 28 January 1621), born Camillo Borghese, was an Italian priest of the Roman Catholic Church and the 234th Pope from 16 May 1605 until his death. He was born in Rome. He was a son of the noble Borghese family of Siena. In June 1596 he was made Cardinal. 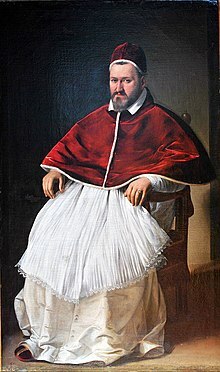 Cardinal Borghese was elected pope in 1605; and he chose to be called Paul V.
Pope Paul was involved in Italian and European political disputes. In October 1615, Paul V received a diplomatic mission from Japan. The embassy was led by Hasekura Tsunenaga. Paul V financed work on the unfinished St. Peter's Basilica. He enlarged the Vatican Palace and Quirinale Palace, restored the Church of Santa Maria Maggiore, constructed or repaired aqueducts. He also made additions to the Vatican library. Paul V canonised Charles Borromeo and Frances of Rome. He beatified Ignatius Loyola, Philip Neri, Theresa of Avila and Francis Xavier. ↑ 2.0 2.1 2.2 2.3 2.4 "Pope Paul V," Catholic Encyclopedia; retrieved 2011-10-27. ↑ "Paul V," Encyclopedia Britannica (1911), p. 956. ↑ Society for the Diffusion of Useful Knowledge. (1833). "Paul V," Penny cyclopaedia, Vols. 17-18, p. 323. "Pope Paul V". Catholic Encyclopedia. New York: Robert Appleton Company. 1913.